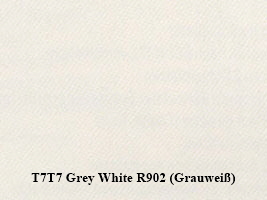 Circa 1990 Volkswagen phased out the rear engined T25 / T3 Transporter. 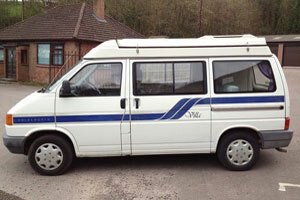 The replacement for the T25 was the front engined T4 Transporter. 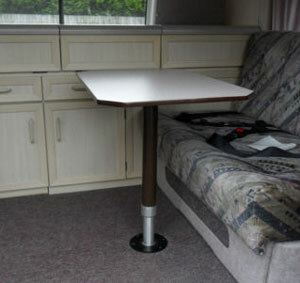 Richard Holdsworth Conversions used the new T4 Transporter as the base vehicle for their latest version of the Holdsworth Villa Camper released circa Sept 1991. 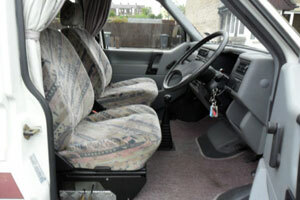 It was available with tintop, high top roof or a solid sided pop top elevating roof and the interior layout was similar in design to the earlier VW T25 Holdsworth Villa but with updated upholstery and improved specification. 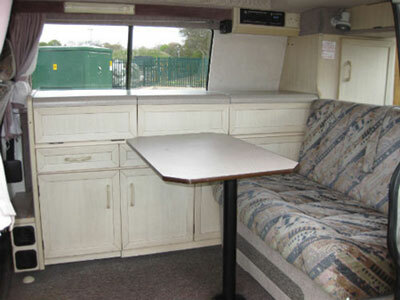 The interior had cupboards along the side behind the drivers seat and the rear seat converted into a 3/4 width double bed. Petrol Watercooled 2.0 Litre, 4 Cylinder, AAC Otto Motor (1968cc), 62 Kw 84 PS, 5 speed manual gearbox, wheelbase 2920 mm, £? Petrol Watercooled 2.5 Litre, 5 Cylinder, AAF / ACU 1993 onwards / AEN 1995 onwards Otto Motor (2461cc), 81 Kw 110 PS, 5 speed manual gearbox, wheelbase 2920 mm, £? Diesel Watercooled 1.9 Litre, 4 Cylinder, 1X (1896cc) 45 Kw 61 PS 5 speed manual gearbox, wheelbase 2920 mm, £? Turbo Diesel Watercooled 1.9 Litre TD, 4 Cylinder, ABL 1993 onwards (1896cc), 50 Kw 68 PS, 5 speed manual gearbox, wheelbase 2920 mm, £? 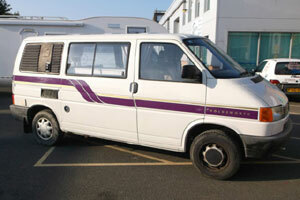 Diesel Watercooled 2.4 Litre, 5 Cylinder, AAB (2370cc) 57 Kw 78 PS 5 speed manual gearbox, wheelbase 2920 mm, £? Turbo Diesel Watercooled TDI 2.5 Litre, 5 Cylinder, ACV 1995 onwards (2461cc) 75 Kw 102 PS 5 speed manual gearbox, wheelbase 2920 mm, £? 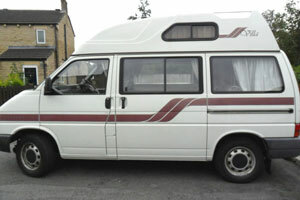 As far as I know the VW Holdsworth Villa was initially available in 1 colour. 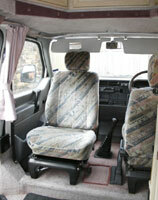 Fully adjustable swivelling cab passenger seat. 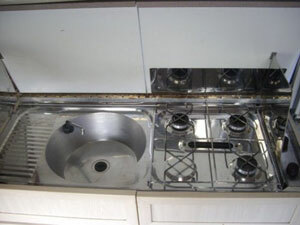 B) & C) Three burner Spinflo stainless steel cooker and grill (with specially designed heat resistant laminated lid so that it can be folded away when not in use) and cupboard below. 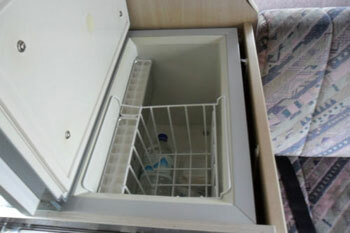 Stainless steel sink (with specially designed heat resistant laminated lid so that it can be folded away when not in use) and cupboards below. 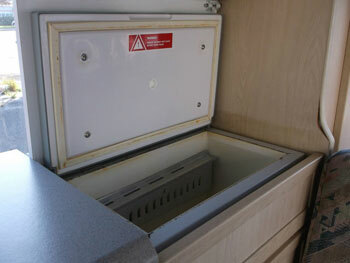 Below the sink is a small hinged flap which gives access to a useful area for stores and utensils. 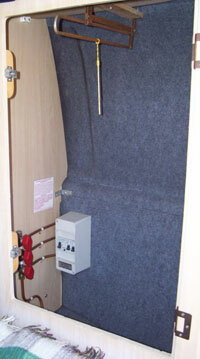 D) Rear Wardrobe with gas cylinder locker underneath (accessible from rear tailgate). 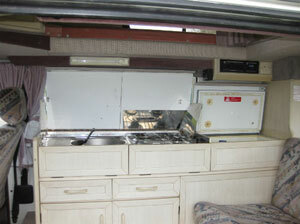 E) Top loading Camping Gaz Greenland Groenland CTL-175 three way refrigerator with lift out basket and ice trays. 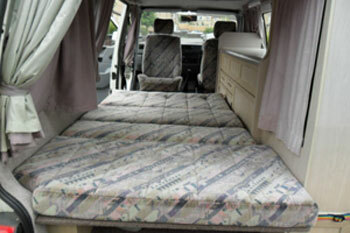 F) Crash tested rock n roll seat converts into a large double bed. G) Slide Out Porta loo toilet. 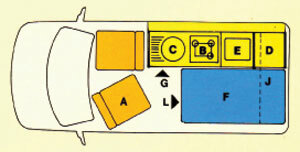 L) Storage below rear passenger seat. 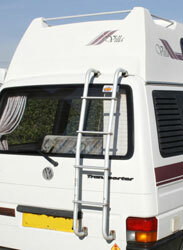 Hightop model had stainless steel ladder with roof rack. Elevating roof model had small roof bars. CEC 225 (Plug In Systems) mains electric hook up with safety protection via RCCD circuit breaker and two MCB’s (in rear wardrobe). 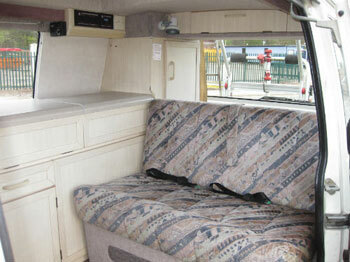 A 240 volt outlet socket inside van next to zig unit. 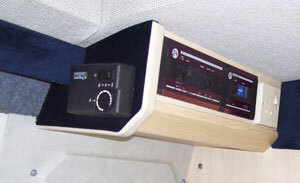 Zig SP-4 electrical control panel with master switches for 12 volt lighting system and water pump. Zig WG 2000 water level gauge. 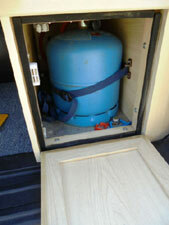 54.5 litre (12 gallon) fresh water tank for pressurised water system with electrically pumped water tap via water pump. Opening sliding window with intermediate locking position (thus allowing ventilation with security) behind sink and cooker. Fluorescent lights and spot light. 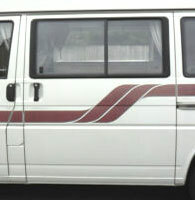 Heated rear window with wash wipe. 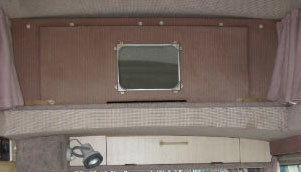 Roof mounted two berth bunk bed. 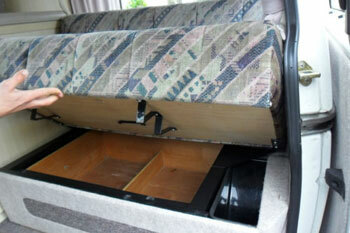 Thermostatically controlled Propex blown air heating system which is flued to exterior of vehicle. 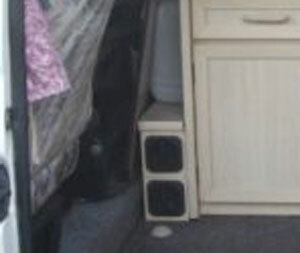 Heater is installed behind drivers seat and the kitchen unit as can be seen in photo below where the vent and outlet holes can be seen forward of the cupboard. 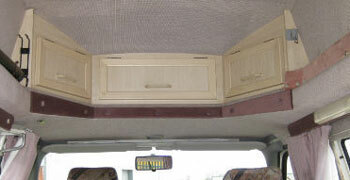 Overhead storage lockers above drivers cab. 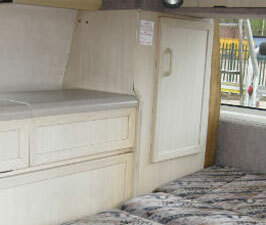 Storage area for bedding in rear roof compartment. Fully insulated solid sided elevating poptop roof. 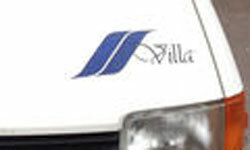 There was normally a small blue or brown Villa logo and stripe on the front and rear of the vehicle and a matching design stripe on the side.